The trials took place in the US and Europe, and give good insight into the consumer reaction to this emerging new mobile advertising media. The findings released by NAVTEQ are on its trials of its LocationPoint advertising network. The ad network uses NAVTEQ’s location service in order to pinpoint where consumers are and deliver ads and calls to actions such as click to map and click to navigate in order to drive traffic to a merchant’s store. For the US trial, the overall average CTR (click through rate) was 2.49% CTR; clearly much higher than many standard CTRs for digital ads. However, the more interesting figure was the consumer interaction after the initial click. Of the subscribers who clicked on an ad, 39% then clicked through to request further information, such as turn-by-turn directions to the merchants retail location. These results mirror those of a similar trial that was conducted in Finland recently in conjunction with McDonalds. 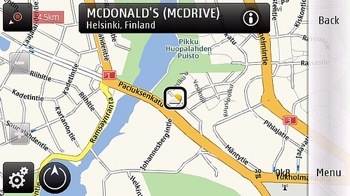 In the Finnish trial, subscribers using Nokia’s Ovi Maps would notified when they were within a certain distance of a McDonalds restaurant. The campaign offered a promotional price on a cheeseburger, and saw a CTR of 7%. Again, fully 39% of those who clicked on an ad went on to request for further information. To read the full press release please click HERE or to read the full press release on the Trial in Finland please click HERE.